WASHINGTON -- When Victor Hugo began writing "Notre-Dame de Paris" – the Hunchback of Notre Dame, in English – in 1829, the Gothic cathedral’s now-beloved stained glass windows had been replaced with simple white glass to let in more light. Half a century earlier, French Revolutionaries had beheaded dozens of statues of biblical kings after mistaking them for French monarchs. Two-hundred years before that, rioting Huguenots trashed the cathedral in opposition to the Catholic Church. 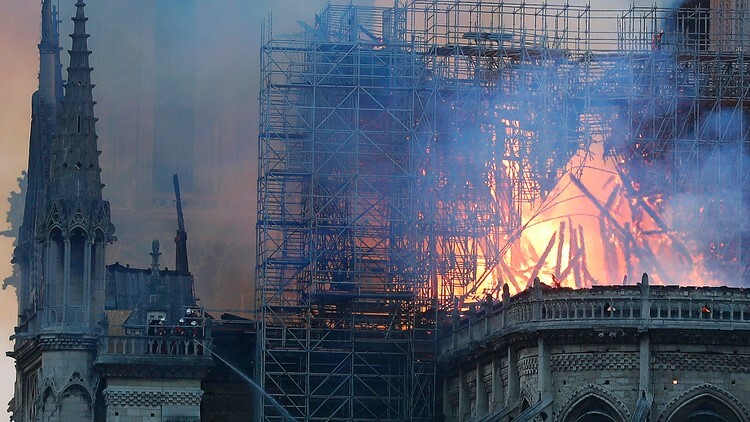 On Monday, as the world watches helplessly while flames engulf Our Lady of Paris, it’s hard to believe anyone would have ever treated the cathedral so callously. But destruction and rebirth are baked into the bones of Notre-Dame. The French Gothic cathedral was "completed" in 1345 A.D. after 182 years of construction. The ceiling of the massive cathedral alone required 13,000 trees to build. The ensuing eight centuries would bring constant renovations and repairs to the church. Visible in pictures of the cathedral from the plaza in front and from across the Seine river, the iconic stained glass windows of Notre-Dame have weathered centuries of human strife. Most well-known of all are the three rose windows which date to the 13th Century. The largest of them, the south rose, was gifted to Notre-Dame by King Louis IX of France, who would also ultimately lead to Notre-Dame housing its venerated circle of thorns. The south rose has been damaged on multiple occasions throughout history, and was entirely rebuilt in 1861 by famed French architect Eugène Emmanuel Viollet-le-Duc, but still retains some of the original glass dating back to the late 1100s. Many of Violett-le-Duc’s windows were again replaced in the 1960s with new windows designed by glassmaker Jacques Le Chevallier. Easy targets for rioters, religious dissidents and the more common variety of vandals – as well as tourists – Notre-Dame’s sculptures are a broad mixture of old and new. The iconic gargoyles, for instance, were installed as rain spouts in the mid-13th Century, while many Gothic figures on the cathedral weren't installed until Viollet-le-Duc's restoration in the 1860s. Prior to Viollet-le-Duc’s restoration, the cathedral contained many more grotesques, which were a common feature of Gothic design. The cathedral's iconography was functional, as well as aesthetic. Catholic parishioners in the 13th Century were unlikely to be literate. The sculptures on the walls and entryways of Notre-Dame and other cathedrals illustrated biblical stories and depicted important saints. There's no better example of the cathedral’s constant cycle of renovation than Notre-Dame's massive 8,000-pipe organ, which has been rebuilt, restored or otherwise modified more than a half dozen times since it was first built in 1403. The list of craftsmen who have worked on the organ is one of some of Europe's most esteemed instrument designers, among them François Thierry, the third in a line of famous French organ builders, and Aristide Cavaillé-Coll – the premiere organ builder of the 19th century. The 10 bells of Notre-Dame have rung for the coronation of kings, to mark the end of both World Wars and to mark the Christian holidays of Easter and the Ascension. One of them, the bell named Emmanuel, is said to produce one of the most beautiful sounds in Europe. The bells have occasionally been recast and replaced, including four destroyed during the French Revolution. One of the most recent is named Benoît-Joseph, in honor of Pope Benedict XVI. 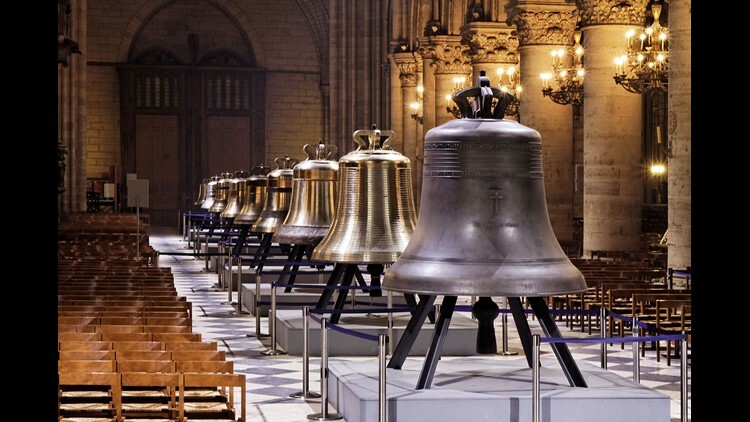 The bells of Notre-Dame de Paris Cathedral on public display in the nave in February 2013 (From left to right) Jean-Marie, Maurice, Benoît-Joseph, Étienne, Marcel, Denis, Anne-Geneviève, Gabriel and Bourdon Marie. As home of the cathedra, or bishop's throne, of the Archdiocese of Paris – and as one of the most well-known and highly visited religious sites in the world – Notre-Dame is home to priceless pieces of art and relics revered by the Catholic faith. Among the latter, those stored at Notre-Dame include a fragment believed to be from the cross on which Jesus Christ was crucified, and the cathedral's most sacred relic: the venerated crown of thorns. The crown was given to King Louis IX in 1238, and ultimately found its way to Notre-Dame following the French Revolution. The relic is housed in reliquaries commissioned by Napoleon and designed by Viollet-le-Duc. The crown doesn’t actually contain any of its original thorns – all of them having been removed and placed in other reliquaries throughout Europe. Parisian media reported that the crown was rescued, along with other important relics and works of art, from the burning cathedral. As of Monday evening, efforts continued to save what could be saved of the cathedral. Videos and photos from the scene showed shocked Parisians standing in quiet horror, watching Notre-Dame burn helplessly. Online, the reaction worldwide was the same. What is lost in the fire will irreplaceable pieces of history. But it almost certainly won't be the end of the history of Notre-Dame. As the grief-stricken gypsy Esmeralda, Our Lady of Paris, consoled herself in Hugo's novel, so too may Paris find comfort in her thoughts: "Love is like a tree: it grows by itself, roots itself deeply in our being and continues to flourish over a heart in ruin." Que Notre-Dame soit comme amour. May Notre-Dame be as love. Jordan Fischer is an investigative reporter with WUSA9. Follow him on Facebook on or Twitter at @JordanOnRecord.